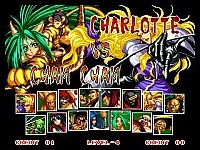 This was definitely one of my most eagerly awaited games ever released for the Neo Geo. I loved the first game and couldn't wait to play this, so as soon as I saw it in my local arcade, I immediately began spending lots of money on it. I was not disappointed, as it has to be one of the finest sequels that SNK has ever made, and was more or less the point where SNK went from being a good 2D developer to a fantastic one. The new fighters deserve a mention too. You now get 15 characters to choose from, which includes a few new ones, although Tam Tam is no longer in it. The new characters include Cham Cham, Genjuro and a very familiar looking guy called Nicotine. If you read my review of SS1 you will know how much I love the Anime film Ninja Scroll, and that the artists who worked on that are the same people who worked on this game. Well, if you want evidence of this then take a look at Nicotine. He is an exact copy of the old guy from Ninja Scroll right down to the clothes he wears and the staff he carries! That old guy made me laugh in the film and he is a good character in the game although not my favourite. Although not massively different this game is improved upon the first graphically. They are more detailed and there are some nice effects, like the waves crashing over the rocks on Haohmaru's stage and much more, and even today I still rate this as one of the most pleasing on the eye 2D games of all time. Sure, by today's standards it isn't the best animated and the sequels to this game all improved on that aspect, but at the time of release it was pretty darned good. As far as I'm concerned it looks GREAT and always will! 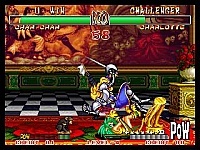 As in the first game, Samurai Shodown 2 is also excellent sonically. There are still lots of great effects for the weapons clanging against each other and the music is great� on stages like Nakoruru's, Galford's and Cham Cham's in particular. Most of it is still mostly atmospheric music, but it all suits the game perfectly and creates a brilliant atmosphere that really draws you into the game. I loved Samurai Shodown 1, but I like this sequel even more. In fact, I know many people that feel this is the very best in the series. Personally, I like all of them, but I don't really like comparing the first two with Samurai Shodown 3 and 4 because they had a big overhaul and were quite different to the first two games; they are very good in their own way, so check out my review on them. I must admit that this Samurai game holds the biggest place in my heart though. Regardless of which you think is better, there is no denying that this is a very good game and definitely worth your time. An absolute classic! Great game, one of the first games I got for my AES and the one I play the most. CLASSIC !! Man the Fatal-series and the KOF-series seems really tough too.